I think it was an early passion for conservation that drove this interest, the understanding that without water, the biodiversity of an entire landscape was threatened. On a domestic level I seem to remember bushveld birds suddenly arriving in our lush Johannesburg garden, apparently quite simply driven by the need for water. It was the stories around the subject of water (or as in that instance, the lack thereof) that fed my curiosity. Tales of people with ideas to solve a looming crisis, and those with solutions to the immediate problem of literally no water in rural villages. 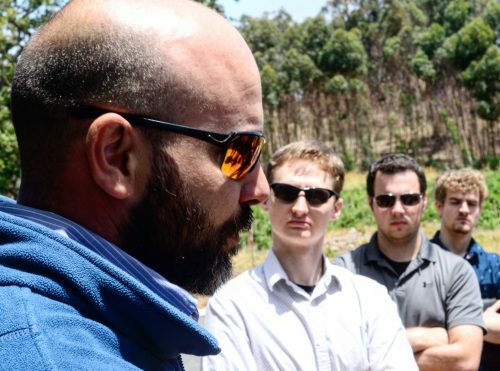 Wine farm manager Christo Loots explains to a group of American MBA students I was leading on a water tour how his blend of biodynamic, organic farming methods have drastically reduced the water consumption on his farm. Like the team I met from REDR, the international ‘registry of engineers for disaster relief’, who fly in to trouble spots – warzones or natural disasters – to provide a solution. Three or four of them had come out to fix a problem that shouldn’t have been a problem. A dodgy deal involving the homeland government of Venda contracting a company to build a dam for around roughly R20 million (a lot of money then) had gone wrong, and no water was forthcoming form the dam. The gentlemen from REDR, for R2000 constructed a simple pipe system that had the villages being fed with water*. 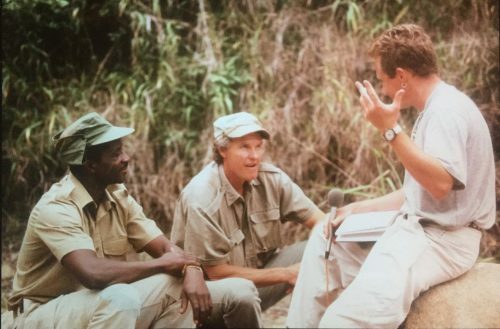 A couple years later, after a conversation with Londolozi Game Reserve’s co-owner John Varty about the threat to the Sand river and the consequences for both the greater Kruger Park and Mozambique downstream, I arranged to do a story for Johannesburg’s Saturday Star newspaper and an SAfm broadcast. A young Angus Begg interviewing a young John Varty about the threatened Sand river in 1995. Commercial foresty planted their pines too close, illegally, to the banks of the river in its earliest stages, when gathering the essential momentum required to become a strong river. Citrus farmers below were erecting illegal weirs to feed their crops. The rural settlement of Tulamahashe, near Bushbuckridge, was struggling with the legacy of apartheid neglect, and random boreholes were sunk to access water. 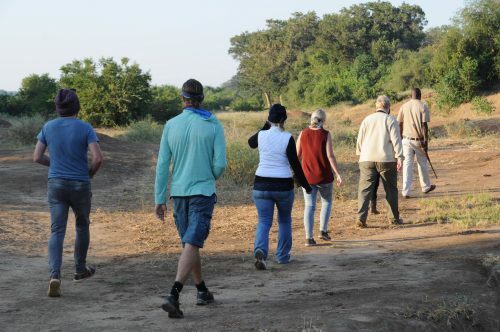 By the time the Sand reached the Sabi Sand Game reserve, in which Londolozi is found (and which falls within the Greater Kruger Park), it was a trickle. After a good rain it would flow, said John at the time, often it was just a narrow channel flowing down one side of the riverbed – as it was on that day in the picture. More often than not it was bone-dry. Which meant Mozambique, on the other side of the park, received nothing. To date, South Africa, not just Cape Town, is still struggling with serious water shortages in between decent seasonal rains. 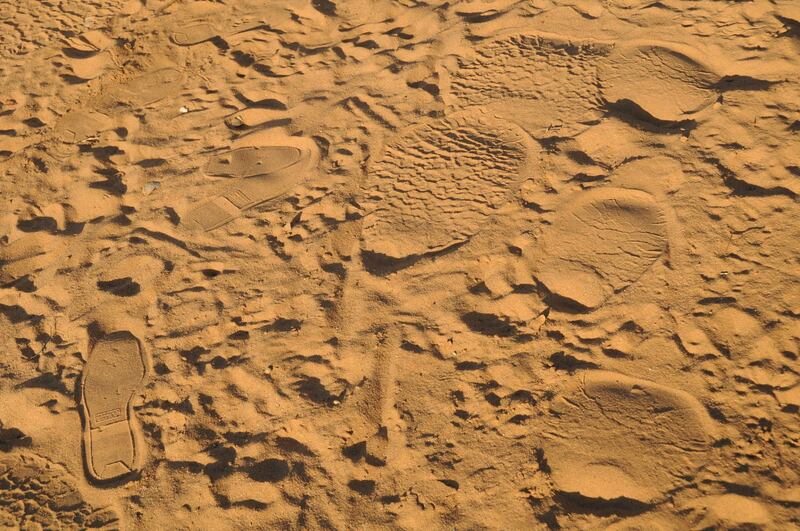 Tourists often walk in dry riverbeds on wilderness trails. With weather forecasters increasingly battling to predict weather patterns with any accuracy, and Capetonians bucketing their way through the last summer, we’ve watched the city implement a controversial ‘day zero’ campaign, and six months later inexplicably lift most of the restrictions. ‘Inexplicably’ because we had been told we would need the equivalent of three rainy seasons, back to back, to fill our dams. This last winter’s rains were merely average to good. 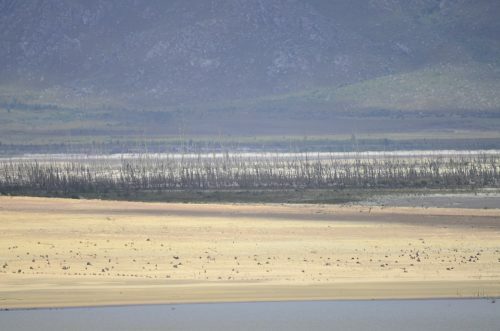 Theewaterskloof Dam, which supplies Cape Town with most of its water, in February 2018, some way into ‘Day Zero’. After creating panic around the city possibly running dry, I have seen no word on why, when or how the city knows that enough water is coming, because from Somerset West to Cape Town, the number of construction developments – office blocks to townhouses – evident just from the N2 highway is considerable. As I would guess is the number of daily new arrivals setting up home in the mother city. They all require water. 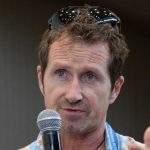 It suggests that we, the public, had better ‘up our game’ and take seriously the business of educating ourselves about water, how much is available, what the desalination plants are producing, and use wisely the water that comes out of our taps. Because water doesn’t come from a tap.